Omega 3 Vs Omega 6 EFAs - Are They Both Good? Omega 3 Vs Omega 6. You've probably heard of both and that they are both good and bad. Confusing? You may have questions about these two nutrients that are commonly lumped together as essential fatty acids (EFAs). "Note the word "essential" - you do need both but did you know that their effects in our bodies are quite different? While both are essential for the human body because we cannot make them from other substances, one is beneficial and the other, while it does have benefits, if consumed in excess, can be quite harmful. Omega 3 benefits include thinning the blood which enables it to flow freely. It helps our hearts to beat properly, our eyes to see, and our brains to function more clearly. Omega 3-rich foods will help to reduce inflammation, and help to combat depression, attention deficit disorder, and bipolar disorder. Omega 6 fatty acids, do the opposite - they thicken the blood and cause inflammation. Excess dietary omega 6 has been linked with such conditions as arthritis, asthma, diabetes, headaches, heart disease, menstrual cramps, stroke, and tumor metastases. A diet rich in omega-6 fatty acids slows metabolism and thus promotes weight gain. Many studies show that they play a role in the promotion of cancers such as breast, colon and prostate cancer. But Omega 6s do have benefits as well; it is an imbalance with too much Omega 6s that is the problem. Omega 3 Vs Omega 6 - Our Changing Oils - The longer shelf life (compared to the past) of various oils and prepared foods containing oils has been achieved by removing omega-3s from the oil as they are more perishable. Over time, food processing has made many foods richer in omega-6 fatty acids and more deficient in omega-3s as food processors have worked to increase shelf life. In recent years, genetic engineering has even begun to develop plant strains with higher omega-6 and lower omega-3 content in order to further extend the storage life of seeds and their oils. And there have been other effects. Farm animals are being fed more soy, corn, and other grains instead of grass and hay. The result is that animal flesh is becoming richer in the less-desirable omega-6 fats. Even farmed fish are now fed grains whereas, in nature small fish eat phytoplankton which is the original source for omega-3 fatty acids in fish. Many fish species, well-known for their healthy fats, only get it by eating the plants that make it or smaller fish that eat the plants. Studies have shown that eggs from free-range chickens on a diet of grass, insects, and a few grains contain twenty times more of the healthy omega-3 fatty acids than standard supermarket eggs. As we get further from the natural state of growing our own food and consume more processed food from the supermarket, our food becomes less healthy in its mixture of oils - and in many other ways as well. Omega 3 Vs Omega 6 - A Nutritional Imbalance - The problem is that many western diets contain 14 - 25 times more omega-6 fatty acids than omega-3 fatty acids, which is much too high on the omega-6 side. A better diet would contain only 2 - 4 times more omega-6 fatty acids than omega-3 fatty acids. This imbalance is contributing to many of our health problems. Where To Get Omega 3s - All the evidence points out that we need to consume plenty of omega-3s in our diet but where can we get them? Omega-3 essential fatty acids are readily available in all greens - lettuce, Swiss chard, spinach, kale etc. 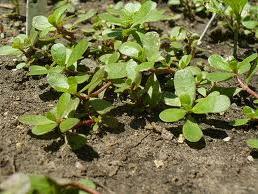 A very high level is found in purslane, a common wild green. It is commonly considered as a weed but not in my garden. There seems to be some confusion over whether the omega-3s found in greens could be turned into forms the body can use. However, research in Africa found a group who ate lots of greens, little fish and no processed omega-6 oils and had the highest omega-3 content of any group studied. Other great sources of omega-3s are flax and chia seeds; sprouted is best. Every evening, I put some of each of these to soak and begin germination for my next morning's breakfast. Omega 3 Vs Omega 6 - Reducing Inflammation Over-the-counter and prescription NSAIDs (ibuprofen, aspirin, Celebres, etc.) work by reducing the formation of inflammatory compounds derived from Omega-6 fatty acids. So some of the same reduction in inflammation could be achieved by simply reducing consumption of foods containing omega-6 oils. Such a simple thing can help to reduce pain without resorting to drugs and their side effects. Along with that, add in high omega 3 foods which reduce inflammation and you are reducing pain and inflammation in two ways. Omega 3 Vs Omega 6 - What to Change - Increasing the omega-3s in our diet is important but not enough; it is also best to decrease intake of omega-6s. "Our problems (related to essential fatty acid balance) are probably caused not by a lack of fish in our diets but by an over consumption of seed oils and under consumption of greens," writes Dr. Artemis Simopoulos in The Omega Diet. We need to reduce or eliminate our intake of such oils as corn oil, peanut oil, safflower oil, sesame oil and sunflower oil. While the whole seed is much healthier, nuts and seeds are a very-concentrated food and you don't want to overdo their use. 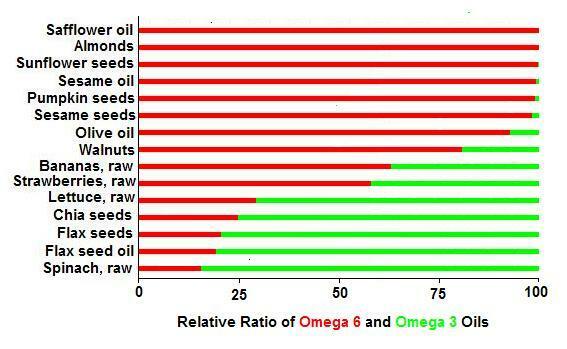 Below is a chart of the relative amounts of omega 3 vs omega 6 oils in various foods. You will see from the chart that, for example, flax seeds have over 4 times as much omega 3s as omega 6s. A diet balanced in the omega oils would have 2 to 4 times as much omega 6s as omega 3s. The problem is that some of the items that people tend to consume large amounts of contain far higher than the ideal amount of omega 6. For example, wheat flour is almost 20 to 1 in favour of omega 6s, rice (long-grain, brown, cooked) has 22 times as much omega 6 and corn has 32 times as much omega 6. Beef has plenty of omega 6 and no omega 3. So the higher proportion of omega 3 in flax seeds and other foods towards the bottom of the chart helps to balance the high-omega-6 foods that people tend to eat too much of. The evidence shows that most people need lots more of these foods.